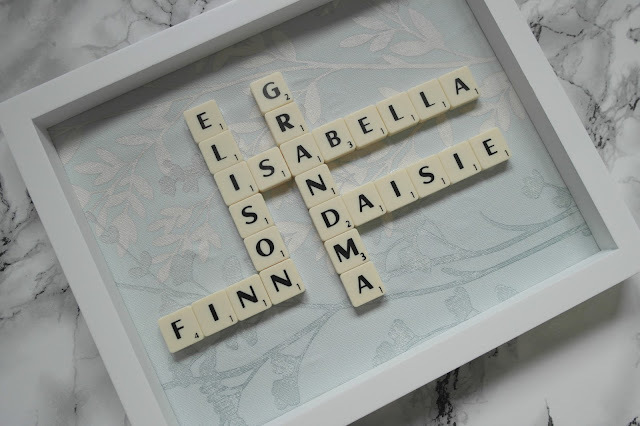 This mothers day (although late, thanks ebay seller) I finally put the frames I bought a little while a go to make some kind of scrabble frame into use and made the girls Grandma one from the girls. I was originally going to have the word GRANDMA with a number of different words of how the girls would describe her coming off the odd one - four letters, then I realised each of her grand children's names would fit perfectly. For the background I was going to buy some scrap book paper but struggled to find any the right size for my chosen frame then came the idea of a map of where she grew up and where her mum lived to add even more hidden meaning but after speaking to Andy I decided against that idea so while in my local Wilkos I took a look at their wallpaper display and chose one Andy liked. Before starting anything I put together a number of different ways the names could go, once I'd decided on one I was happy with I laid them all out in the frame to be sure they would fit and which way would be best. Then out came the glue, I'd originally set out to do the frame the opposite way but it really wouldn't have looked right without any spaces either side of the frame and names, It's not until writing up this post I realise how much I dislike it with the wallpaper running the other way so it's tempting to re-do it again with the wallpaper flowing the right way instead. 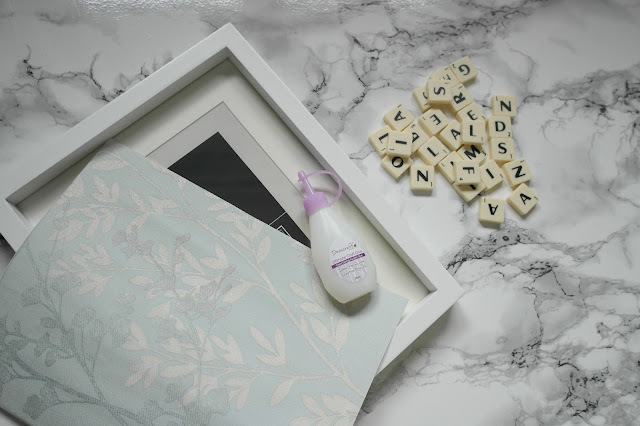 Something I'd recommend is to double check your lettering lay out with the frame on as it wasn't until I put mine in its frame that I noticed some of my letters are slightly off at first glance it's fine but the longer you look at it the more obvious it becomes. She once had a HUGE map which was wonky but she always said her map isn't wonky the world is so that excuse should work just fine. Now I've done one I've got the bug to make another and will be making one ready for the girls new room. Wallpaper sample free from wilkos or any other store with a wallpaper selection. This is such a good idea. I wanted to get one done for my family but they were so much money to order ready made. This is such a bargain!